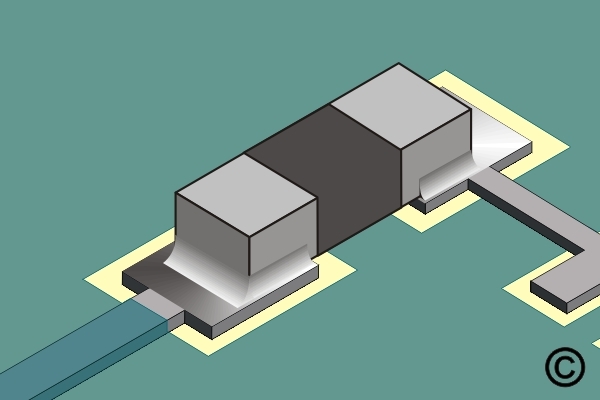 This procedure covers the general guidelines for soldering surface mount chip components. Add a small bead of solder paste to each pad. Move the tool back and forth to heat both solder joints until complete solder melt is observed. The component body of chip resistors is made out of alumna; an extremely hard, white colored material. The resistive material is normally located on the top. Chip resistors are usually mounted with the resistive element facing upwards to help dissipate heat. These components are constructed from several layers of ceramic with internal metallized layers. Because metal heats up much faster than ceramic, ceramic capacitors need to be heated slowly to avoid internal separations between the ceramic and the metal layers. Internal damage will not generally be visible, since any cracks will be inside the ceramic body of the component. Avoid rapid heating of ceramic chip capacitors during soldering operations. 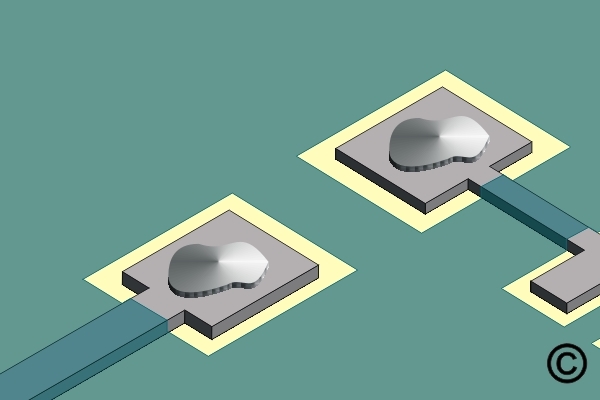 Another style of chip component has a molded plastic body that protects the internal circuitry. There are a number of different types of components that share this type of exterior package. The termination styles for plastic chip component packages vary considerably. MELF - Metal Electrode Face cylindrical components. These may be capacitors, resistors, and diodes. It can be hard to tell them apart - since there is no universal coloring or component designators printed on the component bodies. Figure 1: Add a small bead of solder paste to each pad. 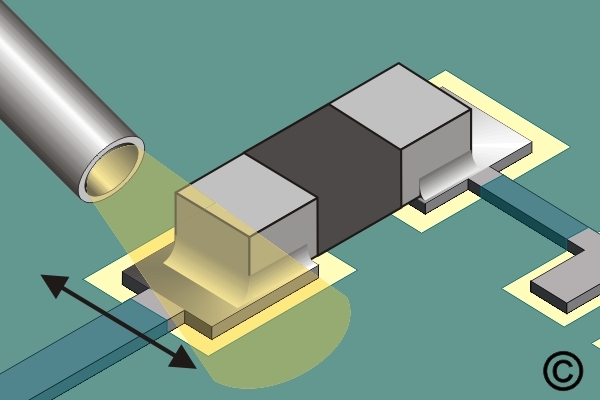 Figure 2: Move the tool back and forth to heat both solder joints until complete solder melt is observed. When the solder paste has pre-dried, the paste will have a dull flat appearance.